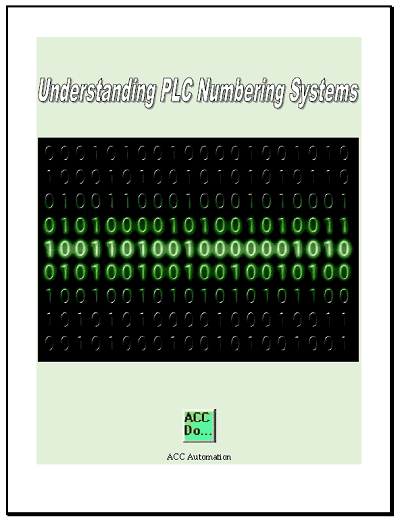 Timers and counters are used in the majority of PLC programs. 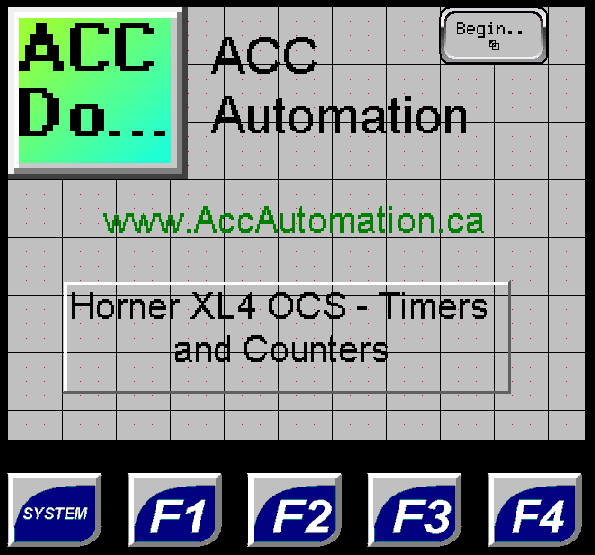 We will not look at how timers and counters can be programmed in the Horner XL4 OCS all-in-one controller. The secret of using timers is a good place to start. This post will walk through a timing chart, so you can implement your own logic. The XL4 has one timer instruction in its instruction set. The options in this instruction allow us to setup On Delay, Retentive On Delay or Off Delay timers. They can have a time base rate of 1ms, 10ms, 100ms or 1s. The timer can also be either 16bit or 32bit. This determines the maximum time that we can have for the timer. Note: You will notice that the 16bit timer requires two consecutive registers in memory and the 32 bit requires three. This is because the second / third register is used for internal use. See the help in the Cscape software for more information. Let’s take a look at an example of a flip flop timer. This would be a timer the turns on for 5 seconds and then off for 5 seconds. Here is the ladder logic for our timer. If temporary bit %T00001 is not on then Timer_1 starts to time. The time base is set for 1 second. The present value is set in register %R00001 and the set value is set for the integer value of 5. Once 5 seconds expire the Relay_Output_2 (%Q0002) turns on. This will then allow Timer_2 to start. Timer_2 has a set value of 5 seconds and the present value is in register %R00003. 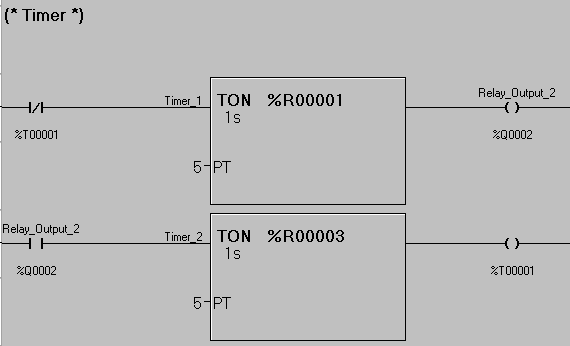 Once Timer_2 times out the output temporary bit %T00001 will then turn on. This will then turn off Timer_1 and Timer_2 resetting both timers. The sequence will then start again. The secret of using counters is another post that will give you background information on using counters. The XL4 has one counter instruction in its instruction set. 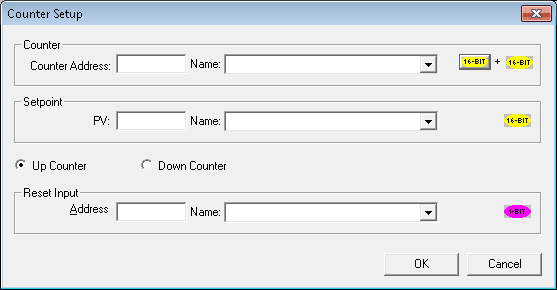 The options in this instruction allow us to setup either an Up Counter or Down Counter. Like the timer instruction we can also set up 32 bit counters. 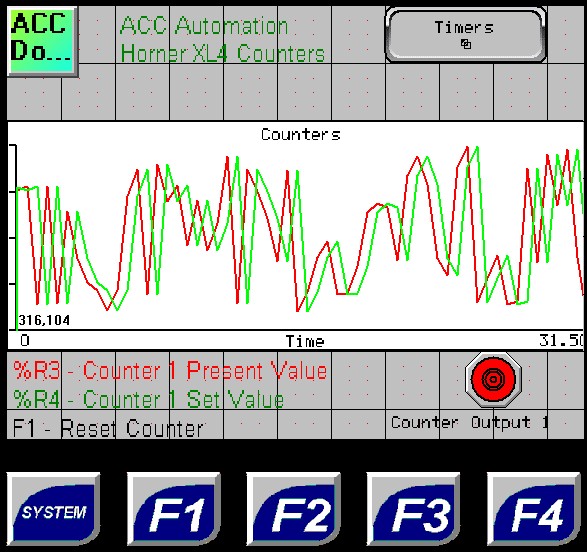 The counter will count on the positive transition of the input signal to the counter. When the count reaches the set value the output will then turn on. 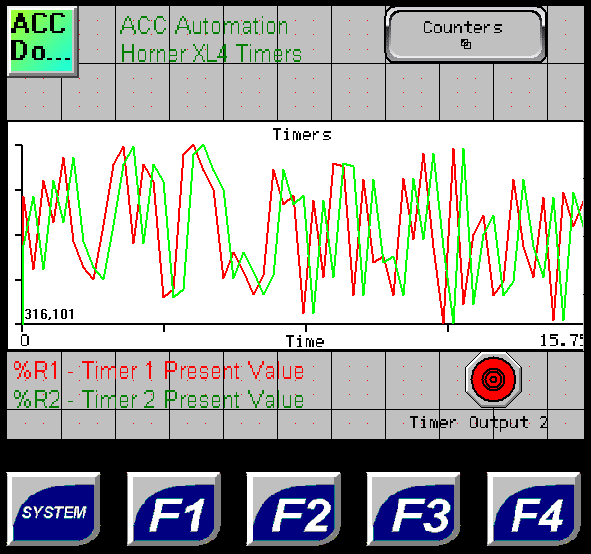 Here is the timing chart for a up counter with a set value of 3. Let’s look at an example. We will use the %S005 (system 1 sec pulse) as the input to the counter. This counter will count to 10 and then turn on an output. 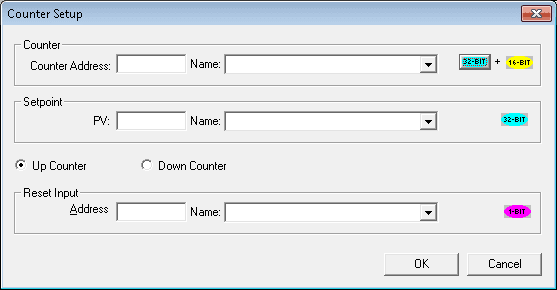 The counter can then be reset by hitting the F1_Key (%K01) on our HMI. Here is the ladder diagram. Note: The present count is in %R00005. This counter also uses %R00006 for internal use. The set value is taken from %R00007. Set points like the set value in %R00007 can be programmed when online with the controller. 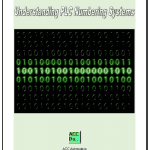 From the main menu select Program | Setpoints… This will allow you to set various registers in the PLC for your program. We will now put both of these programs together along with some additional code so we can display this on our HMI built into the XL4. This is all of the ladder program that is required for our application. We will program in three screens. Bitmaps can be loaded into the controller. We have also included a screen jump object to jump to page 3 when selected. Data trend has been programmed. Pen 1 is for Timer_1 and is red. Pen 2 is for Timer_2 and is green. An indicator is programmed for Timer Output 2. Data trend has been programmed. Pen 1 is for Up_Counter1 and is red. Pen 2 is for Counter1_Set_Value and is green. An indicator is programmed for Relay Output 1. Next time we will look at compare and move instructions.